Total Workshop search results: 12. Displaying Page 1 of your woodworking search phrase KID ROCKING CHAIR. Here we have a friendly turtle incorporated into the rocker design, that will encourage the imagination of any child who sees it. When its time to slow things down, the kids will have fun easing back in their very own chair or rocking chair! Our kids chair is a part of our Maritime furniture collection. The chair has the option to add on the rocker blades as well. Full size drawings. Step-by-step instructions. Children will have a lot of fun rocking it out with their panda rocking toy! Add the painted details in layers or simply paint them on the side. Full size drawings! Make your own furniture perfectly sized for 15 inch baby dolls like the American Girl® Bitty Baby doll pictured here. Your childs favorite baby doll will look adorable sitting in our Baby Doll Duckie Rocker. Simple construction from 3/4 inch thick pine. All patterns are drawn FULL SIZE. 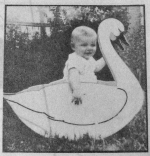 Swan Rocker Vintage Woodworking Plan. The plan says: Baby will be content and safe from harm in this rocker while Mother is occupied with home tasks. This pattern shows the full size swan, to lay out on plywood. 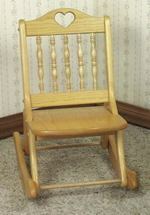 Folding Rocking Chair Woodworking Plan - for 3 to 5 yr olds. Kids will enjoy rocking in their own chair while sitting next to mom or dad who sits in their own rocker. The rocking chair folds easily for storage. 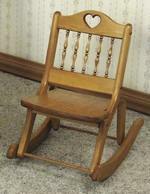 Folding Rocking Chair Woodworking Plan - for ages 1-1/2 to 3 yrs. Building this child size rocking chair is a relatively easy project if you have basic woodworking skills. This rocker will become a childs favorite chair, so it needs to be construted to take a beating. Infant Rocking Horse Chair Woodworking Plan. 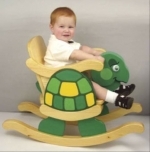 Very similar to our popular Infant Rocking Turtle Chair project (19-W3208). Designed to safely hold the little ones - those infants able to sit up by themselves. Make from 3/4 inch stock.